B Corps. Diversity and inclusion. What do these two things have in common? They were both identified by Independent Sector as key factors affecting the social sector in the years to come. They are also defining characteristics of TMI Consulting – a management consulting firm and certified B Corps that specifically serves as a diversity and inclusion strategy resource for clients. Our mission is to shift the perception from diversity as a liability to diversity as an asset. Our goal is to share why diversity is good for business. We believe cultural competence increases productivity and that diversity of thought yields innovation. We provide strategic planning and leadership development, but specifically in the context of this mission. For example, if a nonprofit organization is in need of assistance with developing a new strategic plan or evaluating their current one with a diversity/inclusion lens in mind, we can make that happen. Learn more about TMI at their website. Why become a B corps? I come from a nonprofit background. My co-founder and I have nonprofit hearts, but we were frustrated with the challenges of running one – the restrictions and chasing funding. Becoming a B Corps allowed us to combine our nonprofit values with the economic impact and flexibility of a business. Learn more about the B Corps movement in our blog series and by visiting B Lab’s website. What were some of challenging aspects of B Corps certification? 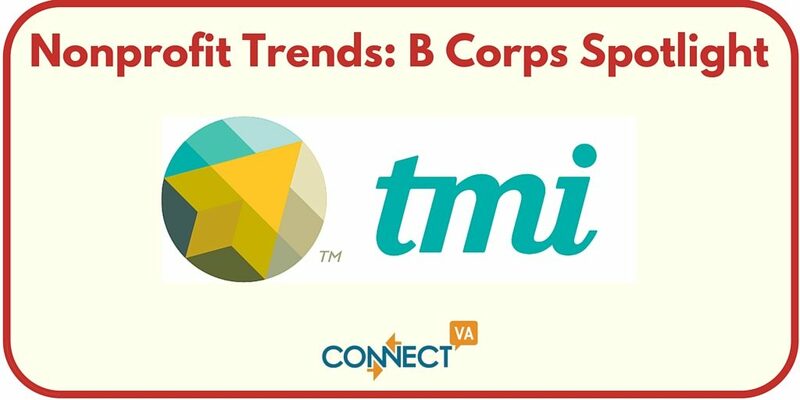 TMI’s metrics surpass the median score for other B Corps across all of B Lab’s benchmarks. * Our lower scoring benchmark, Environment, since it’s not a cornerstone of our mission, is an area that there’s not a lot of room for us to make a bigger impact than we currently do. A non-benchmark related challenge would be the constant process of educating people on what we do and how the B Corps certification differentiates us. 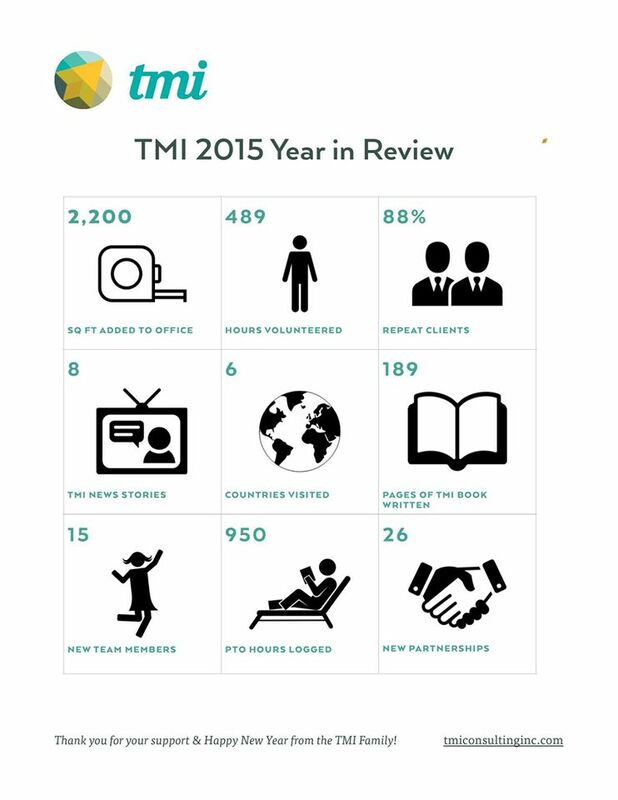 TMI’s B Impact Report. 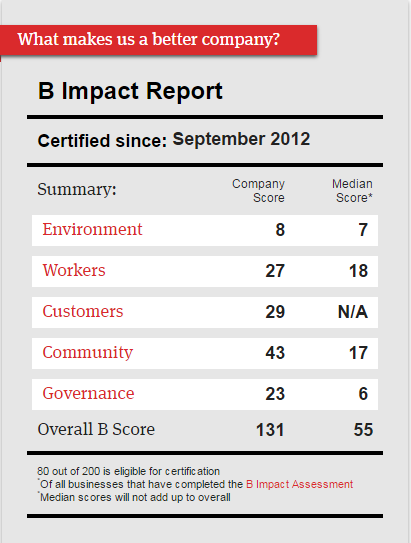 To maintain B Corps certification, businesses must report on their impact in specific key areas. Also, historically, we’ve never had to source any positions. Talented candidates come to us to express interest in employment all the time – especially Millennials, who are often looking for an opportunity to make an impact. We even created a job for someone who reached out to us; she had completed her Master’s thesis on a challenge we were having. Right now, the only job we’re having to source is for a Sales position, which is new for us. Lastly, we are on the GSA schedule*, so we are expanding our presence within the federal government. Being on the GSA schedule also makes it much easier for state and local municipalities to accelerate the procurement process because we have already been vetted. What are your thoughts on the recent tragedy in Orlando? What do you hope our community can learn? It’s a tragic culmination of a lot of issues. I believe we’re looking at a convergence of challenges that have been inadequately addressed that are coming to a head – mental illness, gun violence, and LGBT issue awareness building. We need to take this opportunity for dialogue – to stop the “othering” and meet each other across differences and learn from each other. 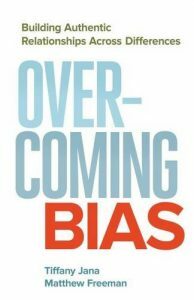 My husband and co-founder of TMI, Matthew Freeman, and I have authored a book – “Overcoming Bias: Building Authentic Relationships across Differences” – which is about us failing to see the humanity in each other and how to overcome that. The book releases on November 1st. You can read more about it and pre-order it on Amazon or your favorite book retailer. *B Lab is the nonprofit organization that advocates for the B Corps movement and leads businesses through the process of becoming certified B Corps.